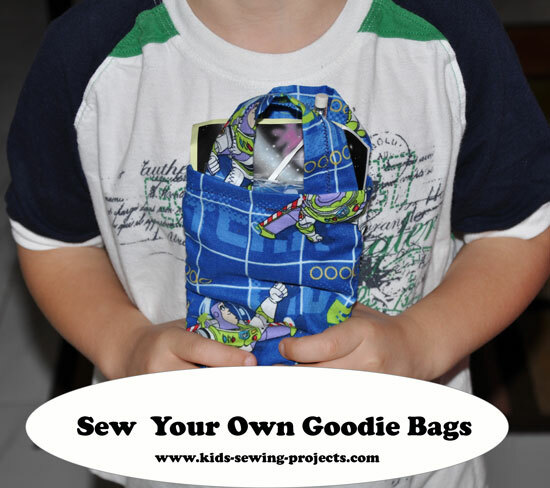 This sew goodie bags tutorial adds a touch of fun to a birthday party. 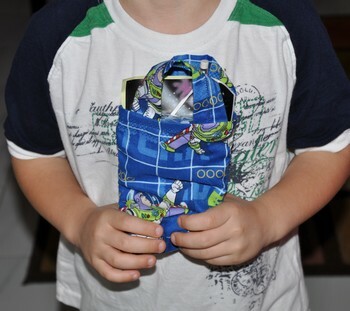 Not only can kids go home with a unique bag filled with party favors, they can reuse the bag over and over. It is a simple bag such as our tote bag instructions but a smaller size. We'll go through the directions below. For each bag, two pieces of fabric cut 9x7 inches. Place right sides together on two bag pieces. Sew along three edges leaving the top open. Set aside and sew straps. 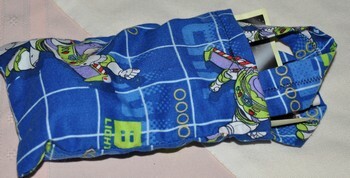 If using a strip of fabric, 10x3 inches, Fold your long edges into the middle one overlapping slightly the other. Pin in place down the middle. Sew zigzag or straight stitch down the middle enclosing the edges in your seams. Repeat with second strap. If using ribbon you can skip to step 3. Taking your bag, turn right sides out and fold top edge down 1/4 inch. Add strap or ribbon end to your folded edge and fold down again enclosing strap within the fold. Pin in place. Making sure strap is pointing up. Sew top edge taking out pins as you go. That's it! Continue process until you have a bag for each party guest and perhaps a few extras. Goodie Bags for a space party. 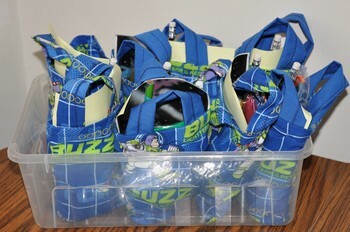 ~Try sewing your own goodie bags and customize your fabric to match the theme of your party. Do you need some ideas on what to stuff inside these fun little bags? You can really have fun with these and a lot of the ideas can come from the children's ages and party theme. Here are some ideas we like to do that doesn't involve candy! plastic toys such as soldiers, dinosaurs, dogs, etc.